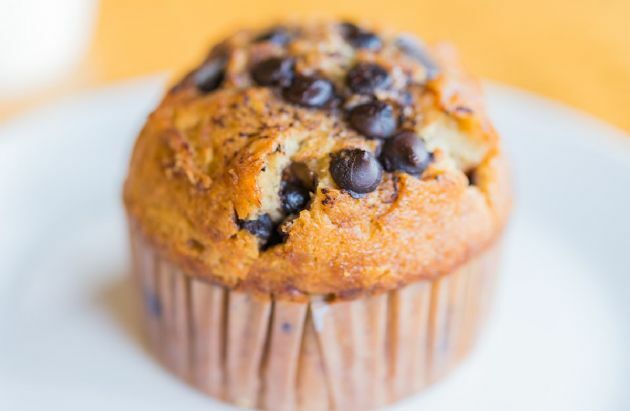 Moist and not too sweet, these banana-chocolate chip muffins are tasty for breakfast, dessert, or a snack. Moist and not too sweet, these banana-chocolate chip muffins are tasty for breakfast, dessert, or a snack. My sister-in-law experimented with many different recipes to get this right. She is a great cook and we all love her muffins. This can also be put in a bread pan to make banana bread. ** I use applesauce in place of butter to make it more healthy/less calories and they still taste REALLY good and I use whole wheat flour. These are delicious muffins, hey anything with chocolate chips usually is. ***To get 24 muffins, I do not fill the muffin tins. I usually fill them about 1/2 way or less. when I plugged in the ingredients I used the applesauce and wheat flour...so that's where the 103 came from. Will a reduced amount of ingredients to make fewer affect the taste? Yes they are very good. DH liked them. I used 1/2 sugar. applesauce and all purpose flour. After the fact the recipe could use Whole wheat.